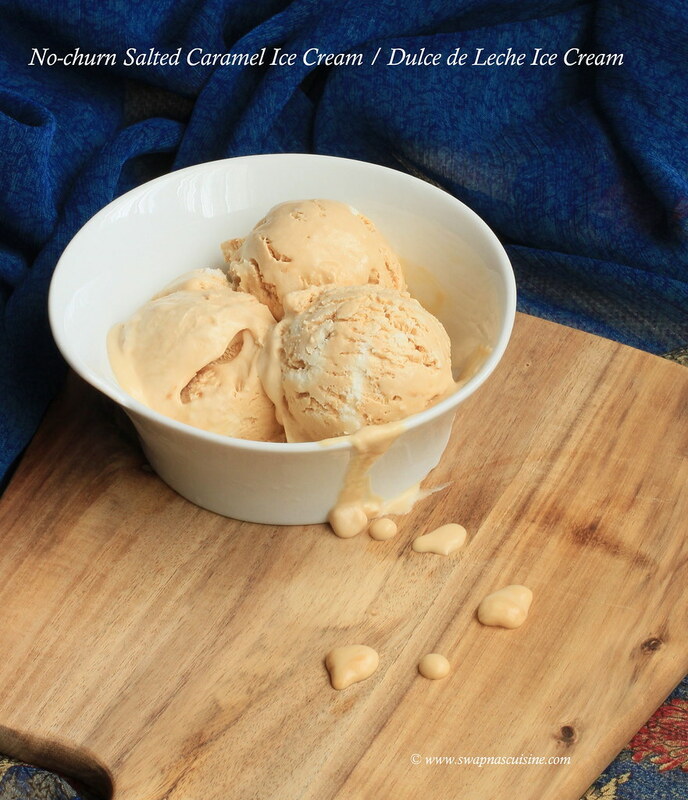 Making a very rich and delicious Salted Caramel Ice Cream without an ice cream maker and with only three ingredients. An extremely easy to make dessert if you have dulce de leche ready in your kitchen. 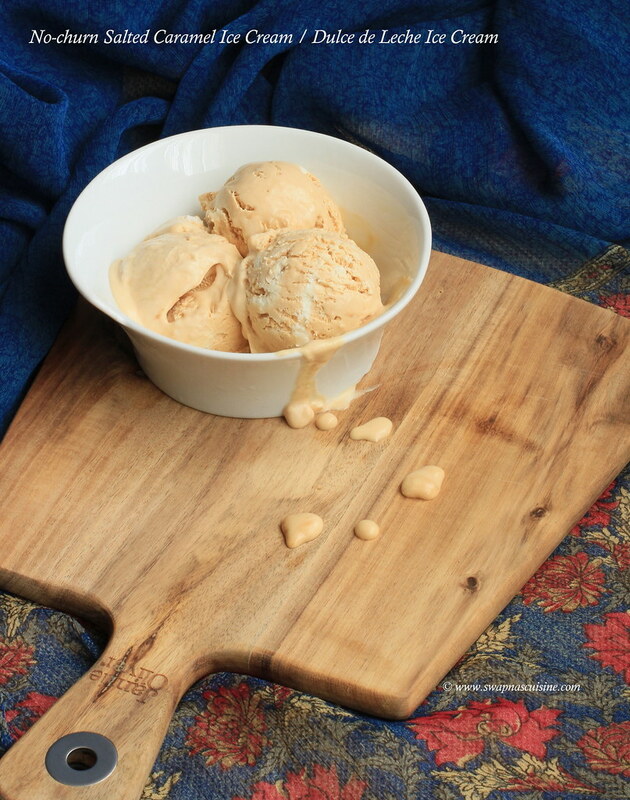 You can either use store bought dulce de leche or can easily make at home. I have explained 3 different methods of boiling the can of condensed milk. You can follow the method you are most comfortable with :) Do try it at home, I am sure you will love this! Combine dulce de leche with salt in a large bowl and keep aside. Using an electric mixer on high speed, beat cream in a large bowl until stiff peaks form, about 3 minutes. Stir about 1/3 of the whipped cream into dulce de leche until just combined. Gently fold remaining whipped cream into dulce de leche mixture, then pour into 9x5" loaf pan. Cover with plastic wrap and freeze until firm, about 6 hours. How to make Dulce the Leche at home. Traditional Method ~ Put the can of condensed milk, unopened, in a large pan, cover with water, bring to boiling point and boil for 3 hours, topping up with boiling water from a kettle as needed. Ensure that the can remains covered in water. Remove and leave to cool completely. Pressure cooker method without weight ~ Fill a pressure cooker with water. Immerse the can into the pressure cooker and close the lid. Switch on the gas on high and wait for steam to come and reduce to medium flame and cook for 1 hour. Pressure cooker method with weight, easiest and less time consuming ~ Fill a pressure cooker with water. Immerse the can into the pressure cooker and close the lid. Switch on the gas on high. Wait for steam to come and then put on the weight. When you hear the first whistle, simmer the flame and let it cook for 30-45 minutes Switch off the gas and let it cool down to room temperature. Hi Swapna, your recipes are just what my heart's after! Although I do use dulce de leche off and on, I haven't tried this ice cream. I know I'm going to love this! Looks amazing! !